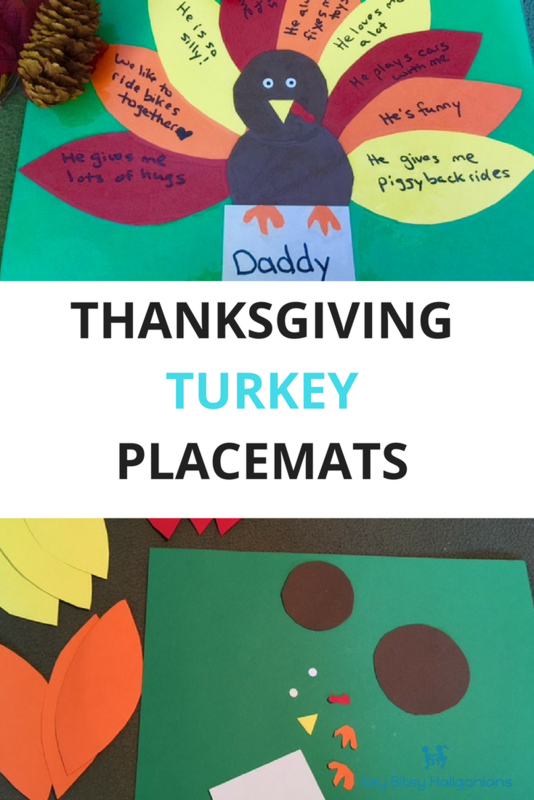 In order to help them understand it a little better, and to involve them in the meal's preparation, I set up a craft for them to create Thanksgiving Turkey Placemats for each of our dinner guests. This gives them something at the feast that they have contributed to preparing, it helps them understand the meaning behind Thanksgiving, and it will definitely bring a little extra joy to our guests. 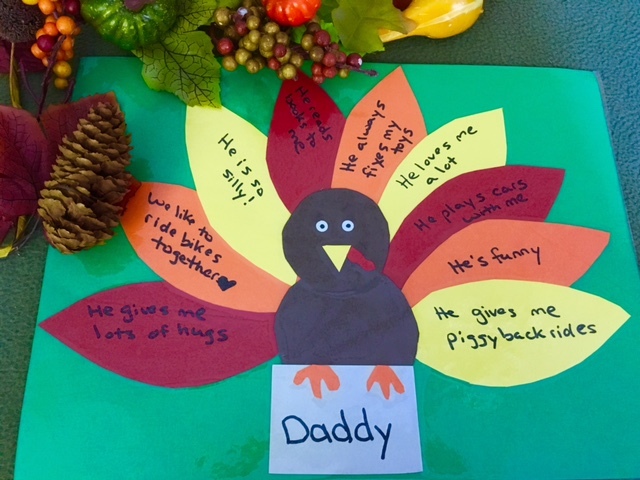 And, as an extra bonus, this craft is part of a Thanksgiving Turkey Hop and at the bottom of the post is a bunch of other fun ideas for your little turkeys. Begin by drawing two brown circles for the turkey, one slightly smaller than the other. I traced a regular drinking glass for the body, and a smaller juice glass for the head. Then cut a rectangle from the white paper that will be used as the name tag. Next, lay the body and the name tag on the green background where you'll want it to go, and draw a turkey feather (basically an oval with pointy ends) freehand on the leftover brown paper to use as a stencil. Cut it out and hold it next to the turkey body to make sure it fits on the background when a bit of it is tucked behind the turkey. Use the stencil to cut out three orange, three red, and three yellow leaves. Snip out a little yellow beak and red waddle for his face, two little orange three-toed feet, and use the hole punch on the white paper to pop out two circles for the eyes. Add a black marker dot in the middle of the white circle for the pupil. Do this for for each placemat you'll need to make and you've got all the pieces you need to get started. Print the name of each person attending on the white rectangles (or have your child write them if they can). Then have the child think of nine things they love and are grateful for about that person. 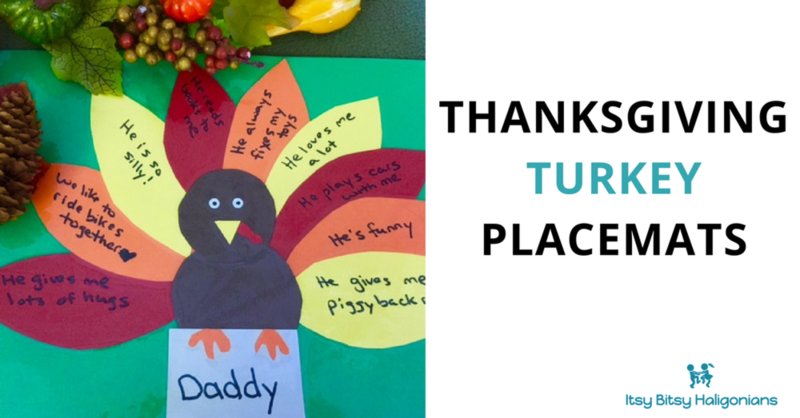 This activity doubles as an opportunity to talk about the meaning of Thanksgiving and why we gather together with loved ones on that day. Write one item the child suggests on each feather until you have all nine. Assemble the placemats by putting a bit of glue in the middle of the turkey body and head to stabilize them, but with the edges unglued so you can tuck the feathers in. Alternate red, orange, and yellow from one side to the other. It may take a little fussing to get them positioned evenly, hence setting them up first. Then add glue to the feathers and tuck them under the body and head, then glue the edges of the turkey down so it's secure. Add the eyes, beak and waddle next with some more glue and then glue the name tag over the front of the turkey's belly. Place the turkey's feet over top so it looks like he's holding the name tag. The final step is to laminate the placemat so it can be used. If you've got a legit laminator then use that. If not, go old school like we did and roll out the clear, sticky paper from the dollar store and cut out enough to go around it. Then peel off the backing (CAREFULLY, don't let it stick to itself!!!) and position the placemat on it. You'll need to trim the corners on an angle so it folds properly (like you're wrapping a present). Seal it down and smooth out any air bubbles. All done! Make sure to have your child help with setting the table so they can be sure their Thanksgiving Turkey Placemats are front and centre for the big day. This blog is part of a blog hop with a group of Maritime Parenting Bloggers! Check out more fun turkey activities to do by clicking on the links below.